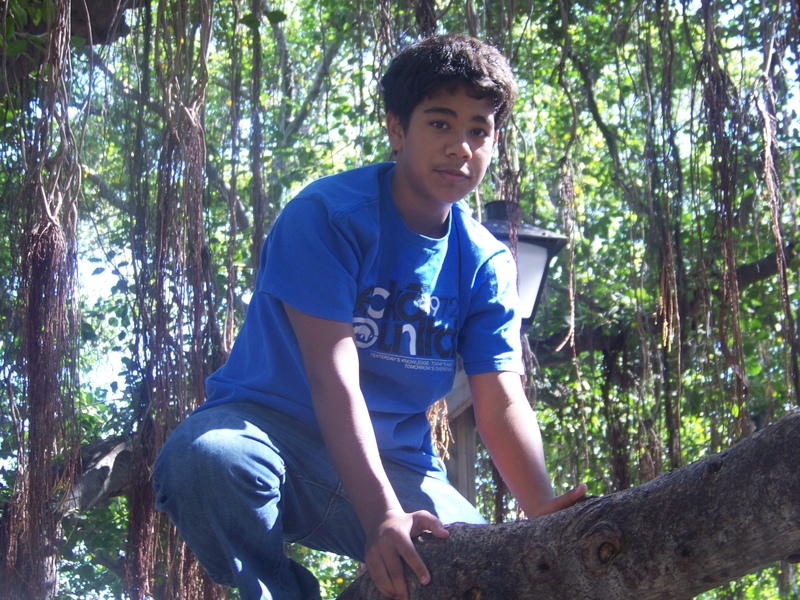 Keawe Segi is 13 years old, and lives with his mother and grandmother in Lahaina, Hawaii, on the island of Maui. There are many ghost stories on Maui, which Keawe has grown up hearing, but he wasn’t sure he believed them since he’d never seen a ghost himself. In late September 2011, however, he had an experience that changed his mind. Keawe Segi has grown up hearing ghost stories on Maui, but until recently wasn't sure he believed them. Photo courtesy of Brie Protzeller. One day, my friend Kawika and I made plans to go to the local mall together. He was going to take the dirt path, along the old railroad tracks, so I said I’d meet him coming from the opposite direction. The railroad tracks run along the highway, but you can barely see the road, because there the road is lined with bushes and trees. My mom had a boyfriend who died when he crashed his motorcycle on the highway and was thrown on the railroad tracks four years ago. His name was Josh. I never knew him, but I knew where he died because there’s a cross marking the spot. Every time I go by, on my way to the beach or something, I see his cross. It’s noisy there because the railroad tracks are so close to the highway, but the noise went silent. I kept walking toward the figure, which was glowing white now. Kawika was close by — we could both see the same boat on a trailer parked along the dirt path— but he saw the figure from the back, and to him it appeared like a dark shadow. I had a strange feeling in my stomach. Then, while I was talking to Kawika, the phone cut out. I had just fully charged the battery, but when I looked at my phone, it was completely dead. I kept walking toward the figure, confused. When I got closer, I saw that it had no feet; it was just walking along and I could see the ground where its feet should’ve been. We were only 20 feet apart at this point, so I could see it clearly now. It hit me like a rock that this was a ghost. I screamed. Then I turned and ran all the way back to my house. Later that night, Kawika and I did end up meeting up and going to the mall. We took a different route this time, but Kawika was still freaked out and kept looking behind him. We couldn’t quite believe that we’d seen a ghost, but we knew it was true since we’d both seen it. I still take the railroad tracks, but not after seven o’clock. Now that I’ve seen one ghost, though, I think I’ll probably see more. I’m still a little freaked out by it — it’s kind of spooky — but I’m excited too. Maybe next time I’ll talk to it, if it’s a friendly spirit, and find out what message it has to give me. 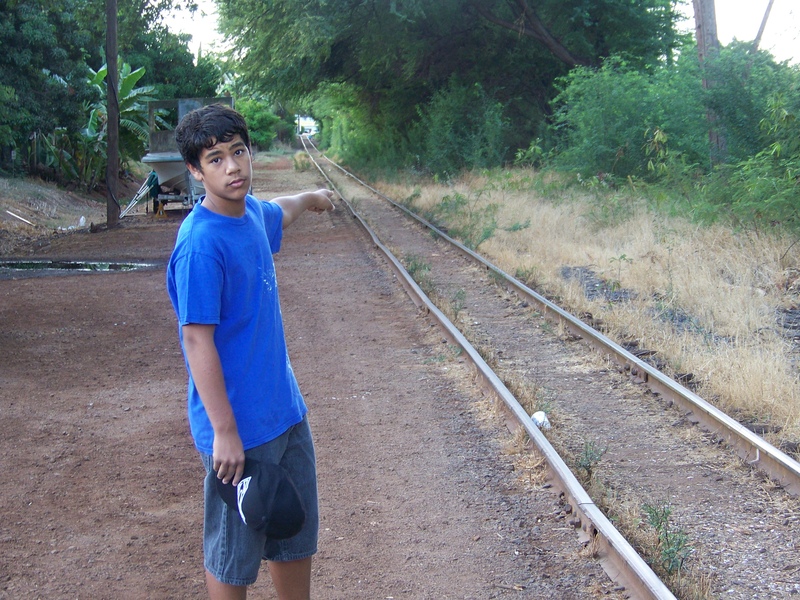 Keawe Segi points to the spot where he saw Josh's ghost. Kawika was too afraid to return to the spot. Photo courtesy of Brie Protzeller. Thanks, I enjoyed that. Keep up the good work. Thanks for reading, Troy! Glad to hear you liked it.